We provide a diverse range of services to support the aerospace industry and its supply chain. Safety and reliability are paramount in the aerospace industry. Failure can be catastrophic. Aerospace manufacturers, distributors, service providers and the supply chain face stringent regulation in performance, quality and reliability. Intertek provides a diverse range of aerospace services and we can support all aspects of production and performance: from research and development and quality control to material certification and failure analysis. Our capabilities span both military and civil – from international airliners and military jets to private fixed wing or rotary aircraft – and we serve key players in the industry. Our services include auditing, inspection, scientific and regulatory consulting, testing, quality assurance and certification. Our inspection and testing of components, jet fuel, products and systems are in accordance with certified procedures and stringent testing methods. Testing services include electrical, chemical, mechanical and non-destructive testing, plus the testing of metals, polymers, plastics and composites. Our expert team of consultants works to ensure compliance to chemical control regulations throughout the supply chain. 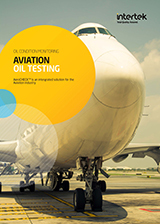 Intertek is accredited to conduct testing in accordance with major industry bodies such as the Civil Aviation Authority (CAA) and Federal Aviation Administration (FAA). Our accreditations provide you with the confidence and peace of mind that your company is operating safely and adhere to regulation. Our quality management systems certification and auditing services help suppliers comply with mandatory regulations so you can become an appointed aerospace supplier. Our auditing provides you with the certification you need to open doors to new markets both domestically and internationally. Intertek is a trusted partner in the provision of global quality and safety services to the aerospace and defence industries, helping ensure increased asset reliability, design integrity and optimal systems performance. Our independent Total Quality Assurance solutions cross the entire spectrum of land, sea and field operations, from vessel and vehicle construction, to maintenance and safety inspections. Note: Intertek consulting services provided for Aerospace are carried out by consulting experts of a separate legal entity who have no influence over any aspect of Intertek Notified Body activities. This white paper will help the equipment designer identify the necessary military standards and test requirements, so that the design can proceed on a basis that is efficient and productive for the manufacturer. Download.